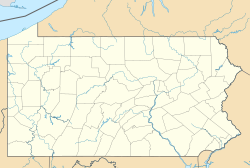 Latrobe is an Amtrak train station located about 40 miles east of Pittsburgh at 329 McKinley Avenue, Latrobe, Pennsylvania. The station is near the center of the city, and is currently served only by Amtrak's Pennsylvanian, which operates once per day in each direction. Until 2005, Latrobe was served by a second daily train, the Three Rivers (a replacement service for the legendary Broadway Limited), an extended version of the Pennsylvanian that terminated in Chicago. Upon its cancellation, the sole Pennsylvanian marked the first time in Latrobe's railway history that the town was served by just a single, daily passenger train. The station was opened in 1903 by the Pennsylvania Railroad as part of a project to elevate the right-of-way as it passed through Latrobe. The architect, William H. Brown, used an eclectic Late Victorian style. It is a one-story, brick building, eight bays wide and five bays deep. It has a flat roof with parapet and a central cross gable. The gable end over the main entrance has a pediment with stone panels and terra cotta decoration. The station was listed on the National Register of Historic Places in 1986. The historic station itself exists, but currently serves as a restaurant. There is no ticket office available at the small shelter (complete with bench seats) which serves as the current station. Due to the small number of passengers, Latrobe Station is a flag stop. The Westmoreland County Transit Authority has one bus route, Route 9/9A - Greensburg/Latrobe/Derry, that stops adjacent to the train station and one other route, Route 20F - New Florence/Greensburg, that stops within 1/4 mile of the station. Greyhound also has an intercity bus stop about 1/4 mile from the station, at 803 Alexandria Street. ^ "Amtrak State Fact Sheet, FY2017, Commonwealth of Pennsylvania" (PDF). Amtrak. November 2017. Retrieved 5 December 2017. ^ "National Historic Landmarks & National Register of Historic Places in Pennsylvania" (Searchable database). CRGIS: Cultural Resources Geographic Information System. Note: This includes Helene Smith; George Swetnam; William Sisson (October 1985). "National Register of Historic Places Inventory Nomination Form: Pennsylvania Railroad: Station (Latrobe)" (PDF). Retrieved 2012-06-10. This page was last edited on 29 March 2019, at 22:15 (UTC).